Welcome to Year 2, the Perfect Penguin class. Our teacher is Mrs Robinson. We are also very lucky to have Miss Watson, Miss Lawson and Mrs Tattersall who also work with us. We are a happy, caring and intelligent class who love to be creative, learn and explore new things. It is really important that we remember to bring our book bags to school every day. We should read at home regularly and have our reading record signed every week. We have PE on a Tuesday and Wednesday every week and after school clubs for KS1 children on Mondays, Wednesdays and Thursdays. 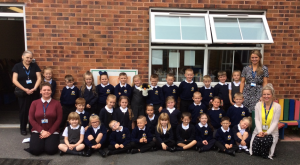 Our class Penguin Phillipa goes home each week with the person who has earnt Star of the week. We keep a diary of what she does at the weekend and share it with the class on Monday mornings. We are looking forward to a great year in Year 2!